The good news is you can have your dip and eat it too (maybe not with reckless abandon, but at least with a little less guilt). The brilliant cooks in the EatingWell Test Kitchen have done it again. They’ve figured out how to make a delicious creamy spinach dip with reduced-fat cream cheese, nonfat yogurt and low-fat cottage cheese instead of full-fat cheese, mayonnaise and sour cream. It will save you a whopping 84 calories and 10 grams of fat per ¼-cup serving when compared to traditional versions. 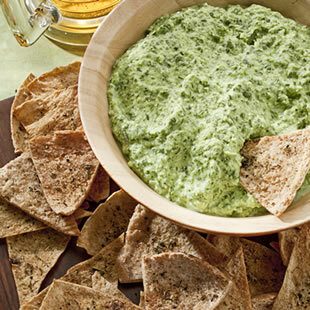 Oh, and no need to eat an entire loaf of bread: serve our creamy spinach dip with some pita chips and crunchy vegetables. What's your speciality dip to feed a crowd? Does it need a healthy makeover?